RCP costs $$$$, slowly but surely we are getting there. The owners have stated that the entire track will be RCP soon enough!!! So when are you stopping by?? Ive stopped by twice already and the second time I actually tried the oval. It was before you guys put the new material on the oval and added the RCP in the infield. My racing is limited to once every other week. I may throw in some practice here and there to increase that number . When are you usually there? I will be there tonight from 5-9, Thurs 5-9 and Fri 5-9. Not sure what my weekend schedule will be but I am sure to be there 1 full day! The oval surface is definitely stickier then when we first opened. Argueably the oval has more grip then the RCP infield. The transition from the oval to the roadcoarse is not as abrupt as you may think. It is a ton of fun. Come check us out. We are racing this Thursday and also Friday as well. Hope to see you there!! A few drivers stopped by on Tuesday for open practice on the oval, these guys have really stepped up there game. Hot Wheels Hobby will have there very own NASCAR tire very shortly. Testing has shown that this tire produces tons of rear bite without premature tire wear. We will have a few sets for people to try in practice tonight. More sets should be available next week. For all of you ROADCOARSE guys, the RCP infield is officially complete. Check out the layout for tonight! Last edited by Davey G; 2008.05.15 at 10:51 AM. Looks nice. Was wondering about the lap counter area will the guys running long antennas in their AM cars be able to go under that without a problem (not everyone has 2.4ghz). Last edited by Cherub1m; 2008.05.16 at 12:23 PM. Last nights races was fun on the Oval, 3 for 3 is good on the winsss. as for the infield track , the new lay out is more fun, the transition to the Oval to infield is even better, great work Dave, my feelings to the drivers that come out here, Come and try the track out, and find out your set up to your cars,that the best way your ever know, do not talk about be about it, and i know you will have fun racing here. Your stuff was dialed on Thursday! See ya soon! Congrats on your TQ, Win and fast lap runs this past Thursday. Thanks for showing off our new tires as well. More will be availble for resale by this upcoming Tuesday. Get them while you can, they are sure to be the HOT TIRE! Monday Night is LOSI Micro night on the oval. Friday Night is Mini Z Nascar (oval) and MR02 (roadcoarse) points series racing. Can you provide some enlightenment about the Giro Z transponders? How much is the pigtail? How do you fasten the transponder? Does it work on all bodies or most??? or does each car get one for the night of racing? How much is the pigtail? - About $4.00, no soldering required. or does each car get one for the night of racing? - So far we have let the drivers keep the transponders in there cars the whole night. We have 24 different transponders, so far we have not had to have people share or return them after there run. Well, I tried the track, I was suprised by the amount of grip the oval has. Its a bit bumpy but the cars stayed planted and the transition is not that abrupt. The angle of transiton is a little sharp but thats ok. I am still partial to the RCP, but this traction substance(forgot the name of it) works well. Yeah your right, you just have to drive it. I was just mentioning a few things that driver need to expect if they come and run on the track. I also forgot to mention if anyone uses a longer than stock antenna (like guitar or piano wire) It may hit the lap counter sensor. Putting the sensor 15 to 20 inches from the track would help, if that distance don't effect the signal between the sensor and transponder. Besides those two things, the track will be very fast on the oval and technical on the infield. 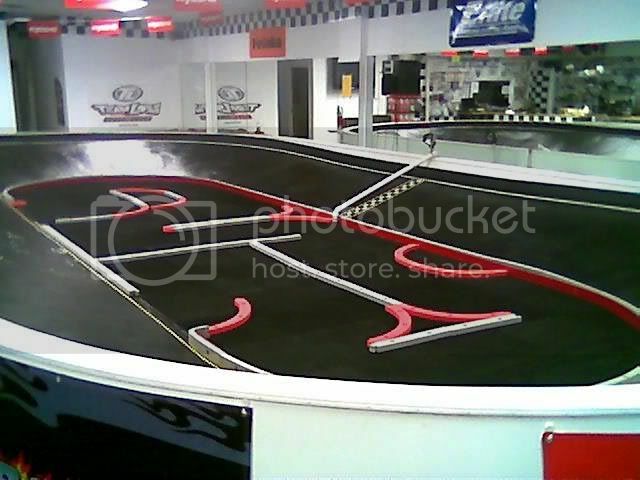 i am using the stock antenna for my 015 nascar and i can say i may have got hit 2 times ever, I think the Oval is the most fun, and for anyone coming in and racing at this track, I am the one to beat on the Oval track, But do not forget i use to race bigger cars, you know what i do like to see every Nascar mini-z drive every laps like Bristol Motor Speedway.it would be cool to see like 4 cars on the same lap.